Hello Doodle peeps! 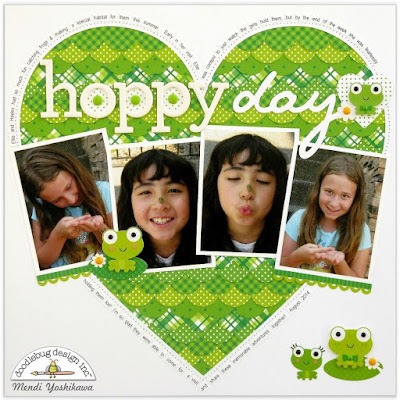 It's Mendi here today with a fun twist on Doodlebug's new Pot O' Gold collection. As soon as I spotted the frogs on the icon sticker sheet I knew I had to create a fun monochromatic layout for these photos I've been holding onto. To show off all the great prints in this collection I decided to cut a number of scalloped borders in each color using Doodlebug's Eyelet Lace and Scallops border die by Sizzix. I adhered the die-cut borders to a piece of piece of scratch cardstock and overlaid the finished piece with a 12x12 white cardstock background which I had cut a heart from using my Silhouette Cameo. To give it a polished look I then stitched around the heart with my sewing machine. When I had all my journaling printed into strips I realized it would be covering up the very scallops that I had spent so much time creating so I chose to cut them into individual words and adhere them to the perimeter of the heart with a glue pen. By cutting them up I was able to hug the curves of the heart. It took a bit more time, but I'm really pleased with the finished results and how it solved my problem. This is so cute!!! 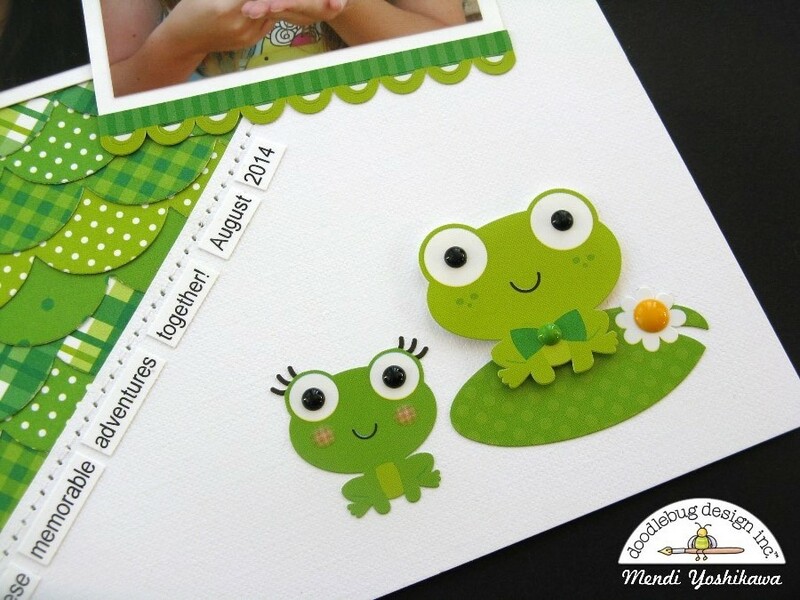 Those little frogs are just adorable! What a fun LO! Those frogs are just the cuttest, especially the one with the eyelashes! It was so brilliant to have cut out your journaling words and to have glued them along the outside of the heart. Thanks for the inspiration! I adore the layers in this! Beautiful layout!